"A creamy spread with salmon and cream cheese. You can add pecans for a twist." In a medium bowl, mix together the salmon, cream cheese, horseradish, lemon juice, and onion. Chill if necessary until firm enough to handle, then form into a ball. 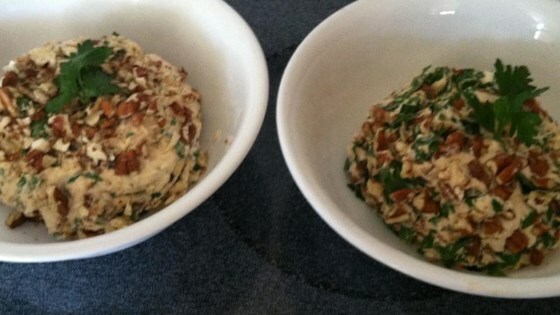 Roll in parsley and/or pecans. Refrigerate until serving. Serve with assorted crackers. Tried it with smoked salmon. You can't go wrong with cream cheese and smoked salmon. Next time I am going to work in some capers. Very nice spread. I would recommend placing all of the ingredients in a food processor to make the pate as smooth as possible. So easy to make and so elegant to serve, people wonder where I find the time! One word describes~~~EXCELLENT~~ Do try to add some liquid smoke. They will think you spent all day in the kitchen.. My guest couldn't get enough & I had to give out the recipe. Thanks! I used 4oz of smoked salmon and added in 1tsp of capers too to kick it up a notch. Wonderful!! Easy to prepare in a food prcessor and do in advance.